"Heimdall" redirects here. For other uses, see Heimdall (disambiguation). In Norse mythology, Heimdallr is a god who possesses the resounding horn Gjallarhorn, owns the golden-maned horse Gulltoppr, is called the shining god and the whitest of the gods, has gold teeth, and is the son of Nine Mothers (who may represent personified waves). Heimdallr is attested as possessing foreknowledge, keen eyesight and hearing, and keeps watch for invaders and the onset of Ragnarök while drinking fine mead in his dwelling Himinbjörg, located where the burning rainbow bridge Bifröst meets the sky. 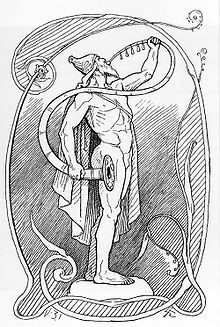 Heimdallr is said to be the originator of social classes among humanity and once regained Freyja's treasured possession Brísingamen while doing battle in the shape of a seal with Loki. Heimdallr and Loki are foretold to kill one another during the events of Ragnarök. Heimdallr is additionally referred to as Rig, Hallinskiði, Gullintanni, and Vindlér or Vindhlér. Heimdallr is attested in the Poetic Edda, compiled in the 13th century from earlier traditional material; in the Prose Edda and Heimskringla, both written in the 13th century by Snorri Sturluson; in the poetry of skalds; and on an Old Norse runic inscription found in England. Two lines of an otherwise lost poem about the god, Heimdalargaldr, survive. 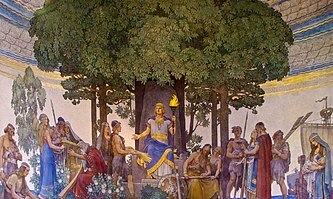 Due to the problematic and enigmatic nature of these attestations, scholars have produced various theories about the nature of the god, including his apparent relation to rams, that he may be a personification of or connected to the world tree Yggdrasil, and potential Indo-European cognates. The etymology of the name is obscure, but 'the one who illuminates the world' has been proposed. Heimdallr may be connected to Mardöll, one of Freyja's names. Heimdallr and its variants are sometimes modernly anglicized as Heimdall (/ˈheɪmdɑːl/; with the nominative -r dropped). A lead spindle whorl bearing an Old Norse Younger Futhark inscription that mentions Heimdallr was discovered in Saltfleetby, England on September 1, 2010. The spindle whorl itself is dated from the year 1000 to 1100 AD. On the inscription, the god Heimdallr is mentioned alongside the god Odin and Þjálfi, a name of one of the god Thor's servants. Regarding the inscription reading, John Hines of Cardiff University comments that there is "quite an essay to be written over the uncertainties of translation and identification here; what are clear, and very important, are the names of two of the Norse gods on the side, Odin and Heimdallr, while Þjalfi (masculine, not the feminine in -a) is the recorded name of a servant of the god Thor." In the Poetic Edda, Heimdallr is attested in six poems; Völuspá, Grímnismál, Lokasenna, Þrymskviða, Rígsþula, and Hrafnagaldr Óðins. great and small, sons of Heimdall. men's ancient saws, those that I best remember. Thou wilt, Valfather, that well I relate. This stanza has led to various scholarly interpretations. The "holy races" have been considered variously as either humanity or the gods. The notion of humanity as "Heimdallr's sons" is otherwise unattested and has also resulted in various interpretations. Some scholars have pointed to the prose introduction to the poem Rígsþula, where Heimdallr is said to have once gone about people, slept between couples, and so doled out classes among them (see Rígsthula section below). his horn is raised; Odin speaks with Mim's head. Regarding this stanza, scholar Andy Orchard comments that the name Gjallarhorn may here mean "horn of the river Gjöll" as "Gjöll is the name of one of the rivers of the Underworld, whence much wisdom is held to derive", but notes that in the poem Grímnismál Heimdallr is said to drink fine mead in his heavenly home Himinbjörg. under the heaven-bright holy tree. understand yet, or what more? Scholar Paul Schach comments that the stanzas in this section of Völuspá are "all very mysterious and obscure, as it was perhaps meant to be". Schach details that "Heimdallar hljóð has aroused much speculation. Snorri [in the Prose Edda] seems to have confused this word with gjallarhorn, but there is otherwise no attestation of the use of hljóð in the sense of 'horn' in Icelandic. Various scholars have read this as "hearing" rather than "horn". Scholar Carolyne Larrington comments that if "hearing" rather than "horn" is understood to appear in this stanza, the stanza indicates that Heimdallr, like Odin, has left a body part in the well; his ear. Larrington says that "Odin exchanged one of his eyes for wisdom from Mimir, guardian of the well, while Heimdall seems to have forfeited his ear." Regarding the above stanza, Henry Adams Bellows comments that "in this stanza the two functions of Heimdall—as father of humanity [ . . . ] and as warder of the gods—seem both to be mentioned, but the second line in the manuscripts is apparently in bad shape, and in the editions it is more or less conjecture". In the poem Lokasenna, Loki flyts with various gods who have met together to feast. At one point during the exchanges, the god Heimdallr says that Loki is drunk and witless, and asks Loki why he won't stop speaking. Loki tells Heimdallr to be silent, that he was fated a "hateful life", that Heimdallr must always have a muddy back, and that he must serve as watchman of the gods. The goddess Skaði interjects and the flyting continues in turn. let him have the famed Brîsinga necklace. and a neat coif set on his head." And a pretty cap to crown his head." and let him don the Brising necklace. Regarding Heimdallr's status as hvítastr ása (variously translated above as "brightest" (Thorpe), "whitest" (Bellows), and "most glittering" (Dodds)) and the comparison to the Vanir, scholar John Lindow comments that there are no other indications of Heimdallr being considered among the Vanir, and that Heimdallr's status as "hvítastr ása " has not been explained. The introductory prose to the poem Rígsþula says that "people say in the old stories" that Heimdallr, described as a god among the Æsir, once fared on a journey. Heimdallr wandered along a seashore, and referred to himself as Rígr. In the poem, Rígr, who is described as a wise and powerful god, walks in the middle of roads on his way to steads, where he meets a variety of couples and dines with them, giving them advice and spending three nights at a time between them in their bed. The wives of the couples become pregnant, and from them come the various classes of humanity. Eventually a warrior home produces a promising boy, and as the boy grows older, Rígr comes out of a thicket, teaches the boy runes, gives him a name, and proclaims him to be his son. Rígr tells him to strike out and get land for himself. The boy does so, and so becomes a great war leader with many estates. He marries a beautiful woman and the two have many children and are happy. One of the children eventually becomes so skilled that he is able to share in runic knowledge with Heimdallr, and so earns the title of Rígr himself. The poem continues without further mention of the god. In the Prose Edda, Heimdallr is mentioned in the books Gylfaginning, Skáldskaparmál, and Háttatal. In Gylfaginning, the enthroned figure of High tells the disguised mythical king Gangleri of various gods, and, in chapter 25, mentions Heimdallr. High says that Heimdallr is known "the white As", is "great and holy", and that nine maidens, all sisters, gave birth to him. Heimdallr is called Hallinskiði and Gullintanni, and he has gold teeth. High continues that Heimdallr lives in "a place" called Himinbjörg and that it is near Bifröst. Heimdallr is the watchman of the gods, and he sits on the edge of heaven to guard the Bifröst bridge from the berg jötnar. Heimdallr requires less sleep than a bird, can see at night just as well as if it were day, and for over a hundred leagues. Heimdallr's hearing is also quite keen; he can hear grass as it grows on the earth, wool as it grows on sheep, and anything louder. 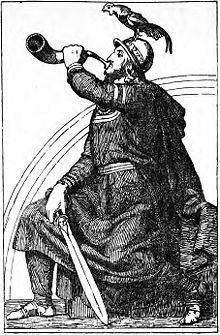 Heimdallr possesses a trumpet, Gjallarhorn, that, when blown, can be heard in all worlds, and "the head is referred to as Heimdall's sword". High then quotes the above-mentioned Grímnismál stanza about Himinbjörg and provides two lines from the otherwise lost poem about Heimdallr, Heimdalargaldr, in which Heimdallr proclaims himself to be the son of Nine Mothers. In chapter 49, High tells of the god Baldr's funeral procession. Various deities are mentioned as having attended, including Heimdallr, who there rode his horse Gulltopr. In chapter 51, High foretells the events of Ragnarök. After the enemies of the gods will gather at the plain Vígríðr, Heimdallr will stand and mightily blow into Gjallarhorn. The gods will awake and assemble together at the thing. At the end of the battle between various gods and their enemies, Heimdallr will face Loki and they will kill one another. After, the world will be engulfed in flames. High then quotes the above-mentioned stanza regarding Heimdallr raising his horn in Völuspá. At the beginning of Skáldskaparmál, Heimdallr is mentioned as having attended a banquet in Asgard with various other deities. Later in the book, Húsdrápa, a poem by 10th century skald Úlfr Uggason, is cited, during which Heimdallr is described as having ridden to Baldr's funeral pyre. Renowned defender [Heimdall] of the powers' way [Bifrost], kind of counsel, competes with Farbauti's terribly sly son at Singastein. Son of eight mothers plus one, might of mood, is first to get hold of the beautiful sea-kidney [jewel, Brisingamen]. I announce it in strands of praise. The chapter points out that in the above Húsdrápa section Heimdallr is said to be the son of nine mothers. Heimdallr is mentioned once in Háttatal. There, in a composition by Snorri Sturluson, a sword is referred to as "Vindhlér's helmet-filler", meaning "Heimdallr's head". In Ynglinga saga compiled in Heimskringla, Snorri presents a euhemerized origin of the Norse gods and rulers descending from them. In chapter 5, Snorri asserts that the Æsir settled in what is now Sweden and built various temples. Snorri writes that Odin settled in Lake Logrin "at a place which formerly was called Sigtúnir. There he erected a large temple and made sacrifices according to the custom of the Æsir. He took possession of the land as far as he had called it Sigtúnir. He gave dwelling places to the temple priests." Snorri adds that, after this, Njörðr dwelt in Nóatún, Freyr dwelt in Uppsala, Heimdall at Himinbjörg, Thor at Þrúðvangr, Baldr at Breiðablik and that to everyone Odin gave fine estates. A figure holding a large horn to his lips and clasping a sword on his hip appears on a stone cross from the Isle of Man. Some scholars have theorized that this figure is a depiction of Heimdallr with Gjallarhorn. A 9th or 10th century Gosforth Cross in Cumbria, England depicts a figure holding a horn and a sword standing defiantly before two open-mouthed beasts. This figure has been often theorized as depicting Heimdallr with Gjallarhorn. The god Heimdall poses one of the most difficult problems in Scandinavian mythography. As all who have dealt with him have emphasized, this is primarily because of a very fragmentary documentation; but even more because the few traits that have been saved from oblivion diverge in too many directions to be easily "thought of together," or to be grouped as members of a unitary structure. Wikimedia Commons has media related to Heimdallr. ^ Simek (2007:135 and 202). ^ "Heimdall". Random House Webster's Unabridged Dictionary. ^ Simek (2007:122, 128, and 363). ^ See discussion at Thorpe (1866:3), Bellows (1923:3), and Larrington (1999:264). ^ Bellows (1923:20). See connected footnote for information on manuscript and editing variations. ^ a b Dodds (2014:110). ^ Faulkes (1995:50). See Faulkes (1995:68) for Úlfr Uggason's Húsdrápa handling this. Daubney, A. (2010). LIN-D92A22: Early Medieval Spindle Whorl. Accessed: Jun 9, 2011 10:42:37 AM. Bailey, Richard N. (1996). England's Earliest Sculptors. University of Toronto. ISBN 0-88844-905-4. MyNDIR (My Norse Digital Image Repository) Illustrations of Heimdallr from manuscripts and early print books. Clicking on the thumbnail will give you the full image and information concerning it.